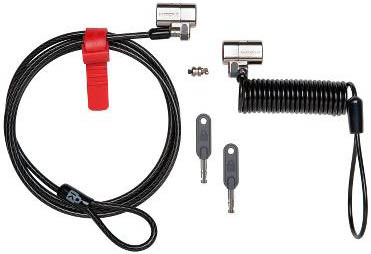 Includes 2 ClickSafe locks with identical keys - 1 for the office and 1 self-coiling lock for travel. Security in one step - protects computers with just one click. Tamper-proof disk-style lock combined with superior materials provide near-impenetrable protection. Super-strong steel cable provides the strongest physical security on the market . The fastest, easiest way to secure a laptop is now available as a security pack with 2 locks: 1 for the office, 1 for the road, or for anywhere you go. The ClickSafe Anywhere Security Pack is our most secure yet, with a tamper-resistant lock head, advanced cable construction and the convenience of using the same key. Just one click and your laptop is secured.